"Greed" is Anssi Tikanmäki's music for the silent film of primitive force directed by Erich von Stroheim in 1923. 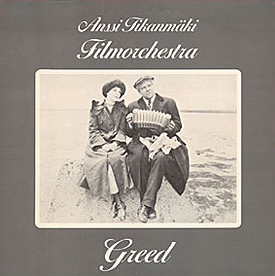 The Tikanmäki Filmorchestra first performed the "Greed" music live with the film at the Sodankylä Film Festival on 13 June 1987 and recorded it the following autumn at the JJ Studio in Tampere. The music will, hopefully, be re-released one day on CD as the vinyl edition is sold out.